Total retail sales of consumer goods in China grew by 8.2% year-on-year to US$984.49bn in the first two months of 2019. Over 85% came from urban areas. Online retail sales of goods and services reached US$208.38bn, accounting for around 21.2% of the total. In the first two months of 2019, total retail sales of consumer goods in China grew by 8.2% year-on-year to 6,606.4 billion yuan (US$984.49bn), according to the National Bureau of Statistics of China. Of the total, the retail sales of consumer goods of units above designated size were 2,309.6 billion yuan (US$344.18bn), an increase of 3.5%. In terms of different areas, the retail sales of consumer goods in urban areas was 5,621.0 billion yuan (US$837.65bn), up by 8.0% year-on-year; while that in rural areas was 985.4 billion yuan (US$146.85bn), up by 9.1%. In terms of different consumption patterns, the catering services were 725.1 billion yuan (US$108.06), up by 9.7% year-on-year. 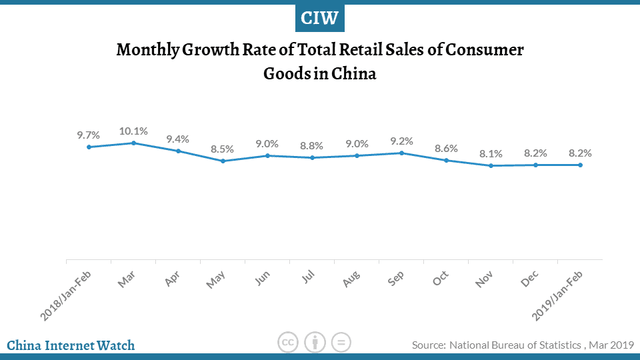 The retail sales of goods were 5,881.3 billion yuan (US$876.44bn), up by 8.0%. Of the retail sales of goods, the income of retail sales of goods of the enterprises (units) above designated size was 2,158.0 billion yuan (US$321.59bn), up by 3.2% year-on-year. Online retail sales of goods and services in China was 1,398.3 billion yuan (US$208.38bn) (around 21.2% of the total), increased by 13.6% year-on-year. Specifically, the online retail sales of physical goods reached 1,090.1 billion yuan (US$162.45bn) with an increase of 19.5%, accounting for 16.5% of the total retail sales of consumer goods. Food, clothing, and other commodities went up by 20.2%, 15.6%, and 20.8%, respectively. 21 FMCG companies reached over 100 million urban households. P&G and Yili led the race, reaching over 160 million families. Nongfu Spring, Haday, and Dali are fastest growers. The total retail sales in China is projected to exceed US$5.6 trillion in 2019. China is expected to raise its global presence to nearly 56% in the online retail market at the end of 2019 and over 63% by 2022. 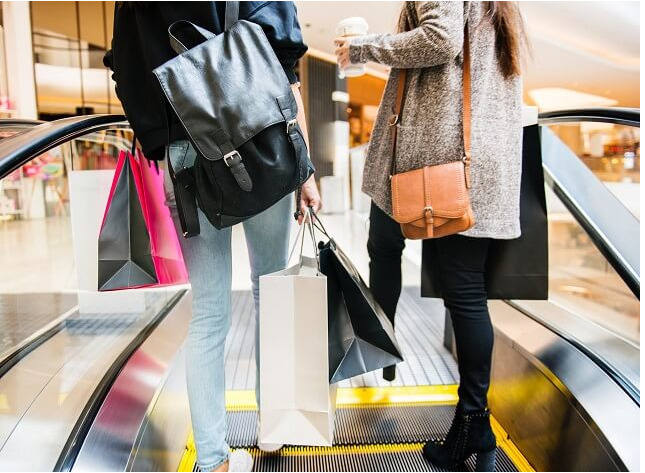 Read China retail trend in 2019 here. Find out what WeChat smart supermarket is like.